The Blasters exemplify the best traditions of American Music, performing with passion and honesty that for over three decades has won the hearts and souls of fans worldwide. Composed of founding members vocalist-guitarist Phil Alvin, drummer Bill Bateman and bassist John Bazz with Keith Wyatt on guitar, they carry on a hard-wonlegacy as one of the most recognizable and credible bands in American Music. Their influences range from the likes of George Jones and Carl Perkins to Ike Turner, Howlin’Wolf, James Brown and Big Joe Turner, all blending into a sound that ignores the lines between Rock & Roll, Country, Blues and Rockabilly. 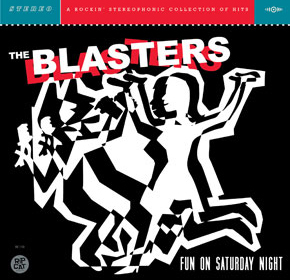 “Fun On Saturday Night” (Rip CatRecords) is the Blasters’ sixth and latest studio album, featuring twelve tracks that extend the band’s legacy of classic recordings. Fronted by Phil Alvin’s powerful vocals, the band follows through with spontaneity, power and grit that make their live performances intoexperiences not to be missed.